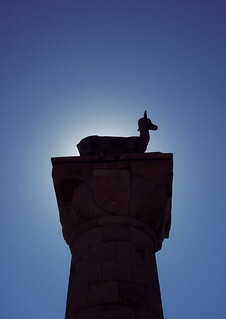 One of the two Rhodian deer statues (one female, one male) that stand either side of the harbour entrance at Rhodes town. People tend to think that they are possibly situated where the feet of the Colossus of Rhodes once stood, the immense statue that was one of the 7-Wonders of the ancient world. It would have stood astride the entrance to the harbour, towering to a height of over 110 feet. Ancient chronicles and archeaological research don't particuarly support this theory, and suggest that before it was demolished by an earthquake in 226BC, it was more likely to have stood off-shore on a breakwater, or on a specially built pedestal to one side of the harbour entrance. Either way, if it had stood with it's feet apart in this way rather than closer together, it would have collapsed under it's own weight, and tall ships would have forever been smacking their masts on his, well, you can imagine, so as lovely an idea as it is, it's most likely bobbins.